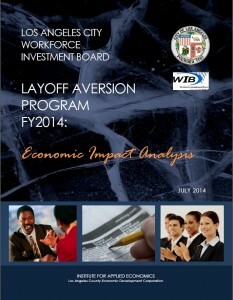 This report provides analysis of jobs saved and ROI of the Layoff Aversion work performed by LAEDC for the City of Los Angeles Workforce Investment Board (WIB), for the Fiscal Year 2014. It finds that the work resulted in the retention of over 5,000 direct jobs for at-risk businesses in City of LA, which includes areas of the San Fernando Valley. Manufacturing jobs accounted for 96% of the total, reflecting awareness of the importance of manufacturing for our local economy and our workforce. With the commitment of City of LA and the staff of LAEDC’s Business Assistance Program, 5,000+ people were able to keep their jobs, which made a difference in the lives of their families and in their communities. In addition, the report states that many more “indirect” jobs were positively affected through this work. According to the HUD standard, the minimum level of public benefit for this contract amount would be the creation of 17 permanent full-time equivalent jobs. The efforts of the Layoff Aversion Program directly yielded 4,915 jobs or one job for every $124 of the funded contract, a retention rate of more than two hundred and eighty times that of the HUD minimum level required. When considering the total efforts of the LAEDC in the L.A. City WIB SDA, through both the Layoff Aversion Program and the Business Assistance Program, a total of 5,054 jobs were saved, one job for every $121 of the funded contract, a retention rate of two hundred and ninety times that of the HUD minimum level required. LAEDC is a non-profit, public-benefit organization dedicated to economic development and job creation, and depends on funding from our partners, members, and philanthropic organizations. The Institute for Applied Economics at LAEDC provides objective analysis of economic impact for many clients, and to learn more, click here.